First of all, thanks to everyone who has supported me and Wrapped In Plastic: Twin Peaks. From friends and family, to fandom and book buyers, I’ve really been the recipient of some wonderful encouragement. Believe me, for someone who has just had their first book published, this sort of enthusiasm is so rewarding. Once again, thank you. 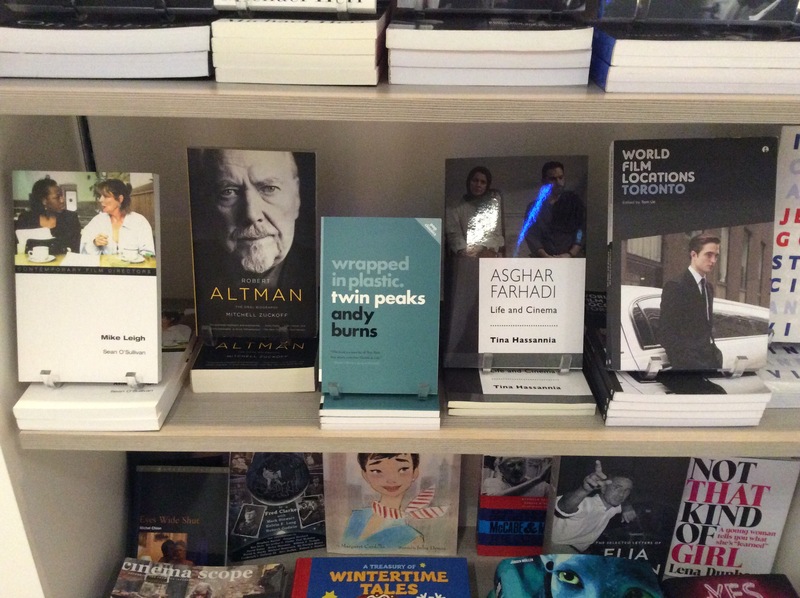 Today I walked into the shop at the TIFF Lightbox in Toronto and discovered Wrapped In Plastic: Twin Peaks positioned upfront, right beside a book on Robert Altman, director of two of my favourite films, The Player and Short Cuts. You can imagine the thrill I had seeing this. A big thanks to David Morris for his immense support and kind words about the book. While I was at the shop, I signed the copies they had on hand, so if you’re in Toronto and want a signed one, that’s the only place that has them. 1) Send me a private message on Facebook at facebook.com/wrappedinplastictwinpeaks. I’m the only one who is reading those. Well, maybe the Illuminati is as well, but that’s unavoidable. 2) In the private message, include your name and mailing address. If the book is for someone other than you, be sure to let me know who I’m signing it to. 3) When I receive the books, I’ll private message you back with details on payment (I’m thinking PayPal or bank transfers are easiest – it will be one or the other). 4) Once I receive payment, I’ll sign and send out your copy right away. I’ll do it snail mail with regular postage so it doesn’t cost me or you anything astronomical. If you want tracking, it will cost extra and you’d have to cover it. Let me know if that’s how you want to go. 5) The book will cost $12.95 US/Canadian. I think that covers everything. Included, while supplies last, will be the limited edition Wrapped In Plastic: Twin Peaks promotional postcard ECW Press created last summer for the book, and which were handed out at the Twin Peaks Festival. There aren’t as ton of these, so its first come, first serve. There you go. Thanks again for the support and interest, and for helping make 2014 a big year for me. Here’s to more of the same in 2015. ← Wrapped In Plastic is shipping to stores! Congrats once again my friend! You’ll be getting a PM from me via Facbook as I definitely want a signed copy!